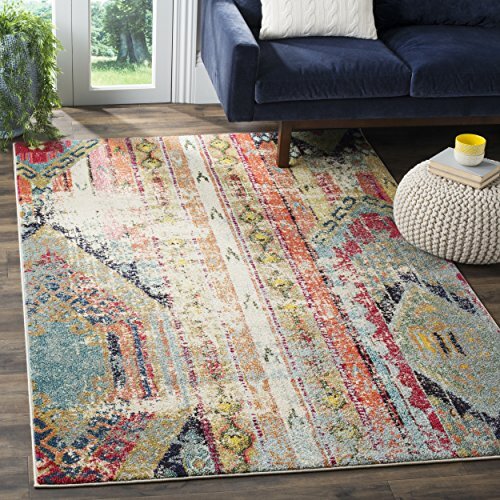 Free-spirited and boldly colored, this rug from Safavieh’s Monaco Collection brings Bohemian-chic flair to contemporary and transitional home décor. Featuring neutral hues of cream, black, and sage, and more vibrant hues of pink, blue, and orange, and yellow, this rug is truly a work of art. Made of power-loomed polypropylene, this rug is virtually non-shedding and is able to withstand high-traffic areas. Its medium cut pile height of 0.5 inches allows for seamless placement under furniture and in entryways. Display this visually charming rug as a focal conversation piece for family and friends to love for years to come.